Here are some of the contents that will be included in my as-yet untitled, second book on VIA. As I've mentioned before, the two biggest improvements to this second book will be more cross-Canada coverage and more photos. What better way to portray both than to include some of the photos I'm able to include. Above: MLW's did make it to Winnipeg. 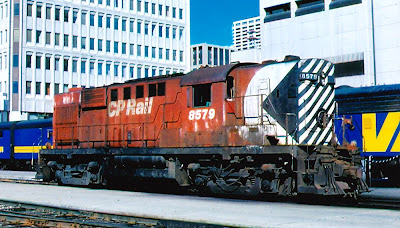 6772 braves the 'Winterpeg' cold while stopped at Union Station nearly in the shadow of the Hotel Fort Garry. 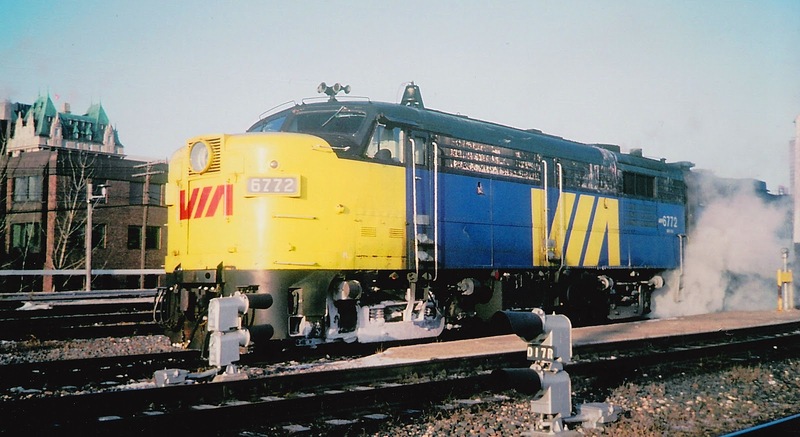 -CP equipment acquired by VIA. It bears repeating that all of the above will be richly supported by photos. I also hope to have some colour photos in the body of the book, as long as the cost of the book can be kept reasonable. I've been most fortunate to have the support of like-minded individuals who have supplied me with some awesome photos. Sometimes I sit chair-bound, flipping through the photos. Then I shake my head vigorously and remember that four-letter word...WORK. This will be a book from an enthusiast's viewpoint, as was my first book. At times, I think there's enough material here for two books. Then I shake my head again and remember that four letter word...EDIT. Content under the above headings will be carefully chosen, retaining a gold-mine worth of information for voracious VIAphiles while leaving ample room for photos. This has been my clearest description so far of what my second book will be like. And much, much more, to use that over-used infomercial phrase. But it's true. I want there to be enough information in this book that you'll have to use a VIA stepbox to get aboard it! I hope you can sense my enthusiasm for this book. I'm really looking forward to this book Eric. Mark me down for one. Glad to hear it, Chris. I feel like I'm about to hog-law, not into my fourteenth hour in today's VIA book work block, which started at 0200! I'm really looking forward to the days when this blog's background goes from blue...to red...finally to green! But I'm not quite there yet. Back to some three-unit, 10-car GO consists on VIA No 73 at Windsor in 1986! This is fantastic news! The first book went a long way to help me decide which generation of Via I will model; with accurate consist info etc. This second book will be icing on the cake and will further develop my knowledge. I would love to see specific 'last revenue date' for all the F's and FPA-4's. Eric, look for me on board 'The Canadian' as its newest on board attendant. I'm glad to share your enthusiasm concerning my second book, and to hear that my first book was useful in your modelling efforts. This was certainly one goal of mine while creating it. Though I don't consider myself a huge locomotive booster (pun intended) I will give VIA's equipment pride-of-place in my second book, locomotives as well as cars. Didn't get your name in your comment though - hope you have some interesting and rewarding experiences while aboard the Canadian! hey Eric. Sorry I didnt leave my name in the first post. Mark Sampson ... VIA advocate. :) PS. I credit Jason Shron for guiding me towards your first book. And, from the 'small world' category, he and his two eldest kids were on the same train as me last week .... which coincidentally was my first trip as a VIA employee! Thanks to you and Jason - it is indeed a small (VIA) world. 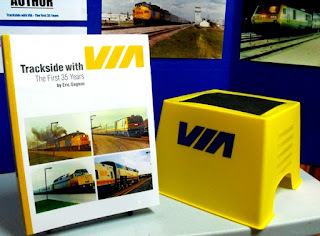 I noticed on the Rapido blog he has a trip account including a photo of your group at Hornepayne.